Many times, all I needed was a single reason to continue the journey in the midst of a million reason to give up. I am always faced with a situation where the odds was a hundred to one. The most important factor is to find a truly important mission. Facing insurmountable odds has become a commonplace where I am concerned. Growing up without a mother was terribly scary and sad, but I managed to survive. How? Because I believed I will survive. Every day as a child I would tell myself that I would grow up just fine. That even when people can break my bones, no one can break my spirit. I always did not have enough during my school days, just one or two sets of uniform, and a few pesos in my pocket but I did not allow anyone to look down on me. I believed in myself and in what I was capable of regardless of what others say. I fought against self-pity and discarded all the thoughts that will weaken my determination. I strived to survive everyday with the grit and zealousness of a wide-eyed child – always looking forward to what each day has to offer. Almost all the decisions I made (and will be making) in mylife is a leap of faith. I am one to never consider all the risk to the pointof being scared in doing what I wanted to do – I am one who would embrace achallenge and knew there were always be dangers and difficulties I need to facealong the way. Despite this, I trudge on, sometimes failing, but always movingforward and trying to finish what I have started. How do I survive? I believe I was born to take on the hard tasks and survive. Today, I face yet another difficult mission – something Imust undertake not alone but with other dreamers and believers. People who think things can be better if we try harder. Some three years ago, I decided to step away from politics. Grateful to have served the city I grew up and had been my home all my life, I wanted to spend the rest of my life helping others in a different capacity. It was painfulto have so many ideas and to be burdened to get these ideas out in an environment where everyone is competing instead of collaborating. For me, nine years as a public servant is already enough to earn me a chance to also live a peaceful life. I started to realize many of my dreams already came true. Examining my heart today, I know I can only be grateful for all that I have. Do I still have a dream? Yes, to be happy. I told myself –happiness is the opposite of a stressful political life. One day, however, I woke up and asked myself – how about the dream of others? Don’t I need to help them achieve their dreams? Am I capable of helping others achieve their dreams? I reminded myself again about what I always believed – I was born to take on the hard tasks and survive. If in the past, I tried to survive for myself, now I feel in my heart, I need to survive for others, for their dreams and aspirations. I need to survive and overcome this latest challenge. Thiscity lacks a vision. It has no direction. Shortsightedness in leadership that only tries to survive every three years has affected the city and citizens have become weary to the point of being apathetic – government has become irrelevant. As I mark my 46th year today, I lift my mission to the Lord. This is His Battle and His Mission – I am just an instrument. The people are out on a mission to change the city – make it brand new – with new and innovative ideas and solutions – and I shall join them once more this time. I am now inspired as I was inspired the first time I joined politics to see this growing interest in really scaling up the city to its highest potential as community with a vision and direction. We all need to work together to see change really happen. The most difficult part is raising resources. But people have been generous with their ideas on how to creatively raise campaign funds. This is the essense of real open governance – people contributing to the overarching goal of creatinga full-integrated city of the future. 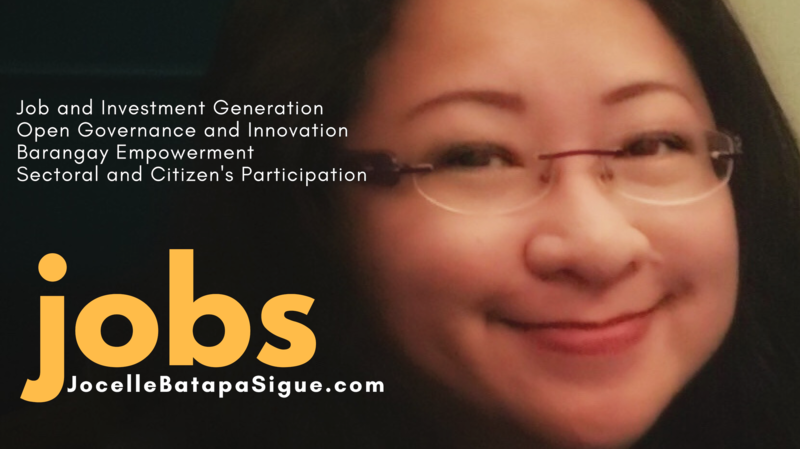 I trust the millennial generation will help my generation –Generation X. If both generations join hands now – we can make a big difference for our city. We just need to believe. Let’s keep the faith.